We’re pleased to announce two new options for online donations to Fr33 Aid: Dwolla and Bitcoin. 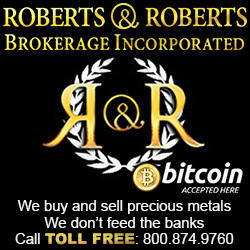 If you’ve seen us in person, you know we’re happy to accept silver, Shire Silver and various currencies. 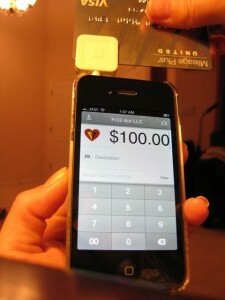 We also recently started accepting credit cards via a smartphone app called Square. Following are details about each of the donation options we offer. Fr33 Aid opened a PayPal account in February 2011. It was very easy to get started, and I was surprised they didn’t require any paperwork or even a bank account to set it up. Then as soon as we received our second $100 donation 2 weeks later, they seized all the funds in our account. They said that in order to use the “non-profit organization” account type, we had to produce a letter from a government with jurisdiction over our operation agreeing that we are a non-profit organization. I uploaded a letter linking to the IRS’s own brochure which states that non-profit status is recognized by the IRS from the date of the organization’s creation, and non-profit organizations operate as non-profits even before they apply for IRS determination of that status. I posted several documents and explanatory letters to the PayPal document server, but nothing worked. I received the same nasty form-email from PayPal over and over, no matter what I did… about 12 emails over the span of 6 weeks, all saying the same thing but from various different PayPal employees, none of whom could be contacted via email. After several document uploads that didn’t change the stream of nasty emails I was receiving, I tried to reach someone at PayPal by phone. They don’t make it easy to contact them; their emails only provided a link from which to upload the documentation they requested. Once I reached someone by phone, she said Fr33 Aid’s Facebook page wasn’t clear enough that the IRS has not yet agreed that we’re non-profit. We updated our page to change our organization type from “non-profit organization” to “non government organization” (actually, we’re both), and we clarified on our donate tab that we’re currently in process of filing for IRS recognition of our non-profit status. After these updates and additional phone calls, they agreed we didn’t have to refund the donations we’d received before their account seizure, and they finally stopped sending me the nasty emails. But they refused to lift the account limitation. In the last phone call I had with PayPal, in June 2011, I was informed there is no way to convert our non-profit PayPal account to a business account. The only way we could accept PayPal donations going forward was to set up a new account, tied to a different bank account. Fortunately, Fr33 Aid’s bank is very helpful and charges no fees or minimum balances on our two accounts. PayPal was holding about $250 that we needed to prepare for supporting PorcFest, and I assured Fr33 Aid’s volunteers that I would reimburse them with my personal funds if PayPal didn’t release the account in time. Fortunately, we and our awesome supporters raised enough funds at PorcFest that we were able to reimburse everyone without needing to cover that expense with personal funds. Last summer, about a month after my last phone call with PayPal, they unfroze our initial non-profit account without explanation. I quickly transferred the funds to our bank, leaving the account balance at about $30. The following month, I received notification that PayPal had seized that account again, but our business account remains fine and so far unseized. Then, in December I was notified that they were allowing transfers from the original account, but it was still limited for any new funds that may be received. There was no explanation for their decision. I quickly transferred the remaining $30 out and keep a very small balance in our main business PayPal account as well. This experience and other reports of arbitrary account seizures leave me wondering if PayPal seizes accounts whenever they want greater access to cash for their own use. PayPal charges 2.9% plus 30 cents for each transfer. This means we receive $96.80 for each $100 donation. PayPal charges the same fees whether donations are made via credit card or from a bank account. On the plus side, they have over 350 million users, and they provide several easy-to-use features like the code for our Donate button. PayPal is our least favorite way to receive donations, but we offer it as a convenience since many people have PayPal accounts. Dwolla is a payment processing network that provides a low-cost alternative to credit cards. We created a Dwolla account two weeks ago, and it was also very easy to set up. We had to create our own “Donate via Dwolla” button for our website, and the features of our Dwolla hub page aren’t as easy to configure as they are on PayPal, but we figured it out. After our experience with PayPal, I read the Dwolla terms of service very carefully, and I found that they are very similar to the PayPal terms, except for the fees. Specifically, Dwolla says they reserve the right to seize our account at any time. I set up our account as a business account instead of non-profit to avoid triggering an experience like we had with PayPal. I did this even though we are operating as a non-profit organization in accordance with IRS rules, pending accumulation of enough financial data to receive their definitive determination of our non-profit status. A brief online search didn’t turn up many Dwolla account seizure stories, and we’re guardedly optimistic. The best part about Dwolla is they charge a flat fee of 25 cents per each transaction, regardless of the amount. Donations under $10 are free via Dwolla. This means we receive $99.75 for each $100 donation, and we receive the full $10 for each $10 donation. It’s not possible to use your credit card to donate via Dwolla, which makes sense since their mission is to render credit cards obsolete. Visit our Dwolla page to learn more and watch a video. A few days ago I downloaded the Bitcoin client and set up an address for Fr33 Aid Bitcoin donations. That part of setup was very easy. 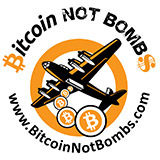 So far we haven’t received any Bitcoin donations, but we look forward to receiving some and learning more about them. There are already a large number of merchants that offer goods in Bitcoins and others who’ll exchange Bitcoins for virtually any other currency. I looked into widgets and apps that would facilitate Bitcoin donations via a button press on our website, but none of the ones I found offered the features we’d need to allow donors to send us a message with their BTC donations or otherwise let us know who they are. This is not a big deal; it just means we won’t be able to thank you pesonally for your donation or send you any gifts. We decided to post our Bitcoin address, along with a QR Code that will allow smartphones to grab it easily and a link where people can download the Bitcoin client for themselves. The best part about Bitcoin is there were no terms of service that I had to accept in order to set up a Bitcoin address for Fr33 Aid. There was no need to link a bank account or enter any identifying information or government-issued tax ID numbers. Bitcoin software is open source, and there is no central authority that imposes fees for each transaction. Fees can be imposed by people who mine and sell Bitcoins, and those fees tend to be very low. As for donations, it’s up to the person making the donation whatever amount he or she wishes to donate. If you send 20 BTC to our address, we receive all 20 BTC. Visit our Bitcoin page to learn more and watch a video. We look forward to receiving our first donation in Bitcoins! Most of the donations we’ve received so far have been in US Federal Reserve Notes, which were donated in person at events we’ve supported. We’ve also received some Canadian dollars and would be willing to accept other currencies as well. Most of our expenses are paid in US dollars, and we incur fees to exchange other types of state-issued currencies into dollars. Exchange merchants often impose fees in their exchange rates, and many also charge commissions or fees on transactions involving less than US $1000. Fr33 Aid opposes state-monopolization of currencies, and we recognize the injustice in the US government’s efforts to put down competition like they did by seizing inventory and prosecuting Bernard von NotHaus, creator of Liberty Dollars. Sadly, given the current unfree environment in which we operate, cash dollar donations are one of the more useful forms we receive. We’ve received several donations in pre-1964 dimes, Silver Circle 1/10 oz silver rounds, Shire Silver cards and Lakota Nation and FSP copper rounds. We used these donations to reimburse volunteers for expenses, since most were willing to accept this form of reimbursement. For now, I encoded the value of the donations in terms of US dollars in our accounting ledger, and I look forward to the day when this type of accounting can be done in terms of real money. To learn more about buying and trading silver, please reference this Silver 101 guide by Kyle Bennett. We’ve received a few donations via check, and one of our donors sends us money orders for $75 every quarter. If you’d like to donate via check or money order, please make them out to Fr33 Aid and send to 10 Benning St., #135, West Lebanon, NH 03784. Our bank is a small local bank close to my house where our banker greets me by name when I walk in the door. We receive the full amount of the donation for each check or money order. Most banks charge a fee for the donor when money orders are created. On the plus side, no bank account or ID is required, and money orders allow you to remain anonymous without the risk of sending cash in the mail. We signed up for Square in October 2011, just before Libertopia. 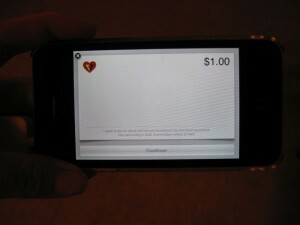 Square is an application for iPhone and Android that allows us to accept credit cards. 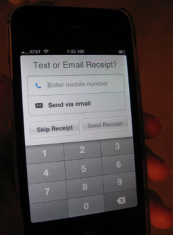 When the donor and his or her credit card are present, we can swipe the card with a little square that attaches to the phone and then ask the donor to sign with their finger on the surface of the phone. Alternatively, for a slightly higher fee, we can also type the credit card and donor details into the application. It was very easy to sign up for Square, and there was no charge for the little square that attaches to the smart phone and allows for swiping of credit cards. The Square terms of service are legalistic, like PayPal and Dwolla. Among other things, they specify that Square reserves the right to delay payment of funds or require a reserve. So far the only credit card donation we’ve received is the one I processed from myself via Square, and it worked very well. After I swiped my card with my iPhone and entered the amount, the Square app displayed a box where I could sign on the phone and then allowed me to select whether I wanted a receipt via SMS or email or no receipt. I opted for email and specified my email address. Square then processed the donation and emailed me a receipt as the donor and also emailed the transaction details to me as the Square merchant. The funds were deposited into Fr33 Aid’s bank account within minutes. In November, I had the opportunity to use a taxi driver’s Square app to pay for my taxi ride. It was very convenient and fun to sign on his iPhone instead of those carbon papers some taxi drivers still use for credit cards. Square charges 2.75% for each transaction with a swiped credit card, and they charge 3.5% plus 15 cents for each transaction in which the credit card details are entered manually. This means that for each $100 donation we receive via swiped credit card, we receive $97.25, and for each $100 donation we receive via emailed or verbal credit card info, we receive $96.35, very comparable to PayPal. So far Square hasn’t imposed any limitations on our transactions or sent us any nasty emails. If at some point we begin selling first aid kits or other items online, we would likely use a store which allows us to process credit cards via Square in addition to PayPal. I’ve learned a lot about these different donation processing options as treasurer of Fr33 Aid for the past year, and I hope this information is useful to you as well. Fr33 Aid is 100% funded by donations, and all of us are volunteers. The generosity of our donors has allowed us to cover all of our startup and operating expenses so far, and we look forward to offering additional programs and continuing to support events through additional funds. If you would like to donate to Fr33 Aid, pick your favorite button in the widget at the top right of our website or see us in person at an upcoming event. *Updated 29 June 2012 with address for checks and money orders. Another Paypal entry from Regretsy. This is really horrible. They asked the buyer to destroy an antique violin…so that he could get his money back. Apparently label disputes are common among violin collectors and the buyer was disputing the authenticity. That’s not to say the violin isn’t still valuable…just not exactly what was expected. Asking someone to destroy a beautiful antique instrument over this dispute is absolutely uncalled for but apparently a part of Paypal’s terms.